You are invited to join for this highly transformational and experiential week to discover, heal, understand, unveil and celebrate your TRUE NATURE as divine human BEING. A loving and caring environment is created by the facilitators and team of helpers for you to open up, to expand and rise into your full potential. This particular tantric path is inspired by Osho and uses various tantric methods and meditations to support you on the journey form the sexuality to love and spirituality. We use 7-chakra map and human design system to understand, awaken and embody our energy, experience ecstatic, creative life and get empowerment and wisdom through own experience. Tantra is a science of life, which includes sexuality, emotions, all senses, love and consciousness and it is very natural, profound and fast way to come back to our true self. 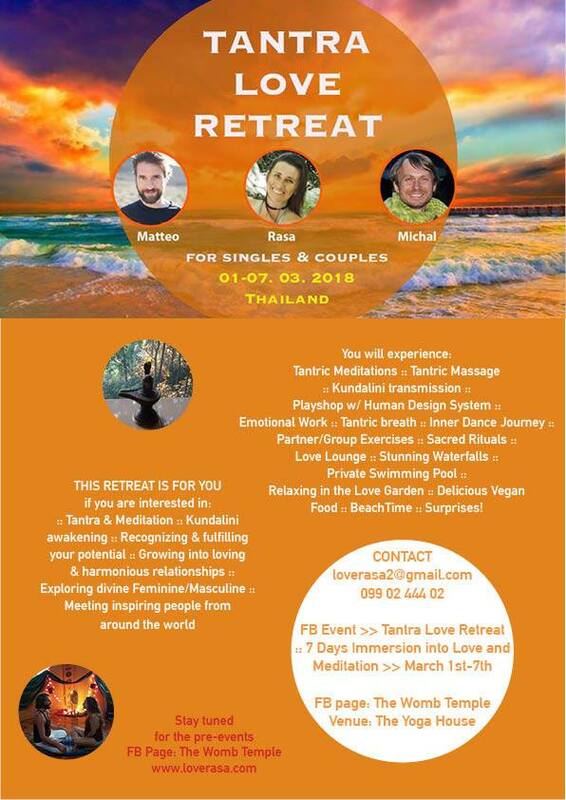 TThis retreat is suitable for beginners and advanced tantric practitioners, single individuals and couples. WHAT TO BRING TO THE RETREAT! The luxury resort The Yoga House in Koh Phangan offers a unique space for hosting retreats and special events. With its natural surrounding and intimate setting, The Yoga House is a perfect place for tantric meditations and it is ideal for relaxing, taking time out, and experiencing Koh Phangan’s special vibe. Although private and secluded The Yoga House is only a few minutes from Koh Phangan’s main beaches, villages and the main town.